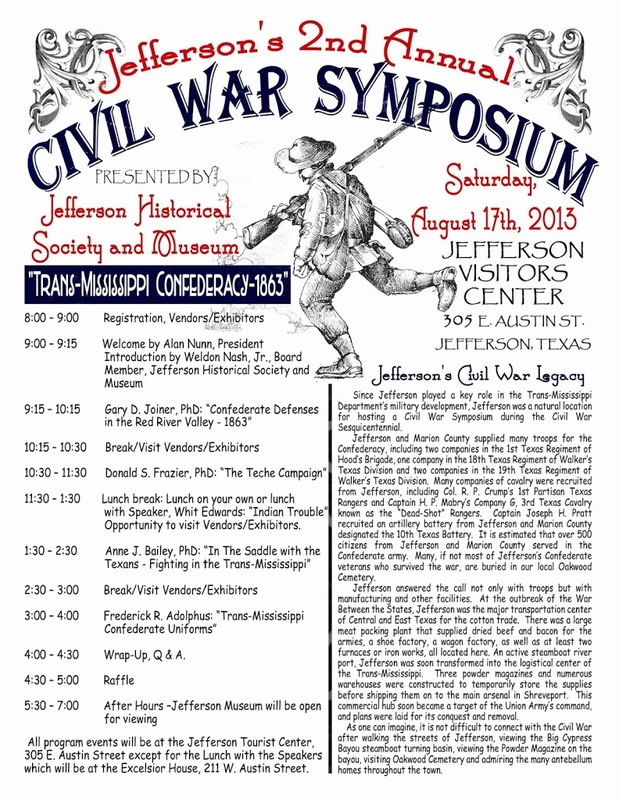 Jefferson Texas is a natural location for hosting Civil War Symposiums. Jefferson did play a key role in the Trans-Mississippi Department’s complex. 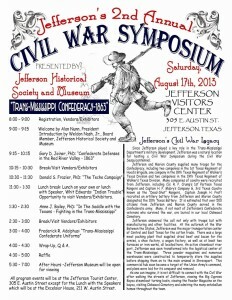 This year’s symposium will focus on the events in the Trans-Mississippi Confederacy during 1863. The day features four noted authors and historians on the history of the Trans-Mississippi Civil War efforts. Donald S. Frazier, Ph.D., is a professor of history at McMurray University and will discuss the Teche Campaign in Louisiana in 1863. Gary D. Joiner, Ph.D, an associate professor at LSUS and chairman of Louisiana’s Sesquicentennial Task Force, will speak on Confederate defenses in the Red River Valley in 1863. Anne J. Bailey, Ph.D, Professor Emerita of history at Georgia College will address Texas cavalry actions in the Trans-Mississippi. Frederick R. Adolphus, the director of the Fort Polk US Army Museum and noted military historian, will present a program on Trans-Mississippi Confederate uniforms. Vendors and exhibitors will be present at the symposium and there will be ample time in the schedule for viewing. The symposium registrants will also be able to visit the Museum as part of their registration. Tickets for the symposium – $40 each and $15 for students. Luncheon with the speakers is $25 per person. The luncheon is limited to 50 registrants. For information on registration, contact the Jefferson Historical Museum at 903-665-2775. This entry was posted in Civil War, Summer Events by Tammy D. Bookmark the permalink.